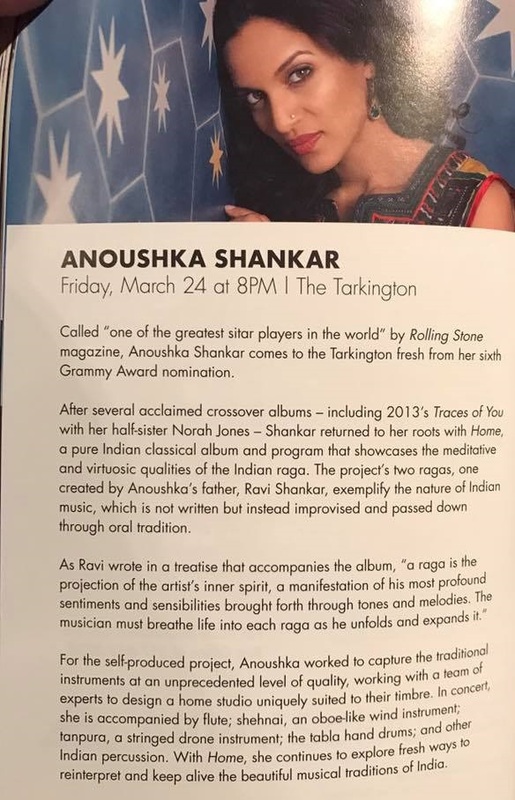 Several hundred music patrons in awe and wonder witnessed Anoushka Shankar, the greatest sitar virtuoso and her amazingly accomplished musicians with their divinely inspired gifts and understanding of ancient Indian Ragas and imaginative contemporary adaptations and improvisations. The appreciative audience experienced being taken on a rare pilgrimage of music. 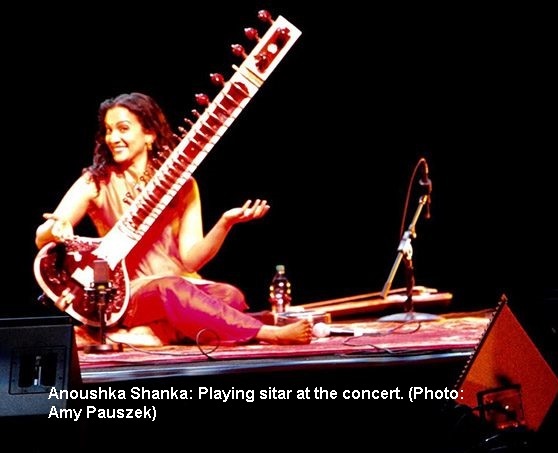 We saw and felt our spirits being taken in a procession led by Anoushka Shankar, a world-class musical genius and six time Grammy Nominee and winner of countless awards and accolades for her traditional and daring musical creativity and collaborations. Anoushka was accompanied by a galaxy of music masters in their own right: Parashanna Thevarajah on mridangam, Sanjeev Shankar on shehnai, Ravichandra Kulur on flute, Kanji Ota on tanpura, and an amazing and breathtaking master on the tabla. 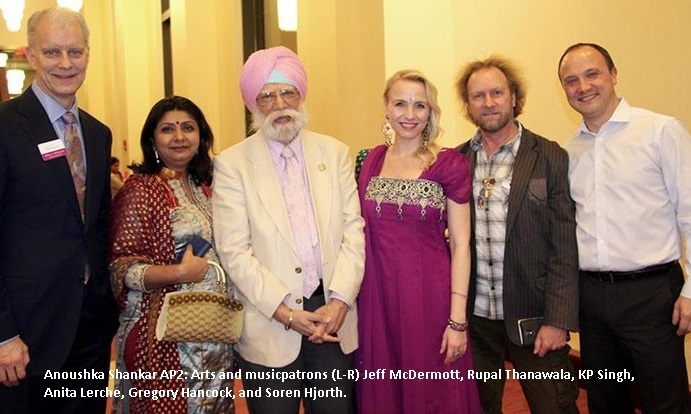 We imagined the privilege of being in a procession of gods, musicians, and devoted patrons witnessing a sacred music offering at the High Altar in the Highest Court, as described in Raag Sodar in Rehraas, the Sikh daily evening prayer. A caravan of images described in that hymn seem to float past my mind’s eye and spirit: “Vajay Teray Naad anaake asunkha, Kaytay Teray Vavunn Haray; Kaytay Teray Raag Puree sio kahiyah, Kaytay Teray gavun haraye: There (in Your Court), countless musicians playing melodious musical instruments are present. These numerous accomplished musicians and singers are offering resplendent songs of Veneration and Praise.” We marveled at the original compositions of Anoushka Shankar; were treated to the favorite Ragas and Ragas composed by the Late Pandit Ravi Shankar, father of Anoushka and the illustrious and celebrated music maestro of Sitar and Bharat Rattna of India. 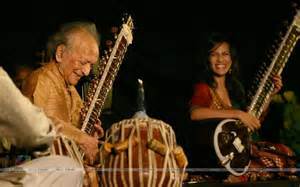 I had the honor of meeting Pandit Ravi Shankar in Indianapolis in 1985 and hearing him play on several occasions (during 1958-65) at the Indian Institute of Technology at Kharagpur, India where I went to school for my Architecture and Planning Degrees. Tonight on a stage with oriental carpets at the Performing Arts Center in Carmel, we saw: a young master work her creative magic and lift an audience into exultation and veneration of music as a universally celebrated art form; gradual build-up of tempos, rhythms, and exuberant crescendos and a celestial aura of music descend in the Tarkington Theatre. Witnessed a symphonic dance of musical sounds and intense instrumental synchronicity; a Raagmala of sounds, the arts, seasons, moods, and emotions; an Aarti (a prayer) unfolding the majesty of classical music in myriad Ragas as an unequaled divine blessing parade before us. We had a rare opportunity to witness Anoushka Shankar, a classical music genius, and accompanying celebrated musicians work their magic to fill the space, tug the hearts and spirits of the gathered audience with images of contemplation, meditation, veneration, reflection, celebration, and experience a festive pilgrimage across layers of human emotions to destinations of temporal awe and celestial wonder. The string, percussion, and breath instruments took us on a processional to other resplendent cultural courtyards and spiritual crossroads, led by an amazing mistress of transcendent sounds and Raagmalas in music, to sacred temples of spirit that reverberated with the songs of our oneness that are in music. We saw a dazzling glow and a momentous encounter with the richness in the arts and as a treasured Divine blessing.